Summer, World Cup, heat. The humid summer weather has finally arrived in the Washington, DC area. After our unusual, long, cold winter, I don't think anyone is complaining. 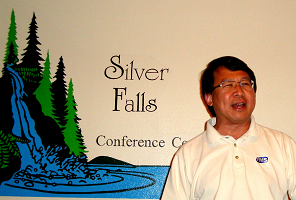 Last month, I had a wonderful time speaking and attending the annual Portland Access User Group Conference at Silver Falls State Park, Oregon. It's always a wonderful time seeing the friendly faces of the Access community with attendees from across the US, Canada, and Australia to Russia. Jack Stockton, Geoff Hollander and Nancy Sittig Smith do a wonderful job organizing the event. Hope you can make it to next year's event in May. Be sure to sign up early as it sold out faster than ever this year. We are very pleased to release the Microsoft Access 2013 version of Total Access Emailer, the most popular email program for Microsoft Access. A free trial is available if you're not familiar with it. This joins our recent releases of Microsoft Access 2013 versions of Total Visual Agent and Total Access Speller. Our development team is busy updating our other products as well. Meanwhile, Microsoft is undergoing a huge shift to the cloud. We have been using Office365 for the past year and exploring the Access Web platform now that it works with SQL Server. At this point, Access web apps can only offer the most basic of data sharing over the web with very limited automation features. I'll be happy when it can build what could be done in Access 1.1. By storing its data in a SQL Server database that can be linked by Access desktop databases, hybrid solutions are possible. We'll be covering more on Access web apps in the near future. To learn more about Office365, we have free Office 365 trial links you can use and if you're part of a non-profit organization, Microsoft is offering the service for free. Recent videos from the Microsoft Access team are included in this newsletter. To keep track of the 22 year legacy of Microsoft Access, we've created a new paper that documents all the Access versions, service packs, and recent updates. Hope that helps. This newsletter includes much of the news we've shared on our Facebook page, Blog and Twitter feed over the past few months. We hope you've been able to keep up with our various activities and sharing of news. Be sure to Like our Facebook page for the most timely information. Total Access Emailer is the most popular email automation program for Microsoft Access. It simplifies the sending of personalized emails with Access data and reports to everyone on your list. Here's a complete list of new features. Download the free trial version and send your own personalized emails from Microsoft Access. FMS has worked with Microsoft Access since it debuted in 1992. There have been many Access versions since then with multiple service packs, hot fixes and updates. This paper offers a list of what and when it was released, feature differences between versions and additional details for the more recent versions. To document all the versions and changes, we've written a new article summarizing the evolution of Microsoft Access: Microsoft Access Version Releases, Service Packs, Hotfixes, and Updates History. Visit our Microsoft Access Developer Help Center for additional articles with tips for creating great solutions. When you try to open a database, you may encounter this error message: Could not use [Database Name]; file already in use. This error message may correctly explain that someone else has the database opened exclusively. It can also occur if that's not the case, but there's an incompatibility with the system workgroup files among your users. Read our paper Microsoft Access Error 3045 (Could Not Use Database; File Already in Use) May Not be Due to an Exclusive Lock for details. A Microsoft Access table allows you set a Number field to Decimal Field Size. Unfortunately, there are problems with this and you should stick to Double field size. Read Avoid Using Decimal Field Size in Microsoft Access Tables for details. Update on InfoPath and SharePoint Forms by Greg Lindhorst, Bob Piper, and Sonya Koptyev. This InfoPath session includes some very early work of its integration with Access. Have you been curious about Microsoft cloud offering of Office365? No longer interested in hosting your own Exchange Server? Want to have your infrastructure in a secure data center with high reliability and resilience? If so, we have Free Trials for Office365. We also have trial links to Microsoft Dynamics CRM. Test it out and see if you like it. We switched to Office365 over a year ago starting with our Exchange Server. We already had our email hosted offsite, but moving it to Office365 was relatively smooth and made it easier and cheaper to support different mobile devices. We then migrated our SharePoint platform to Office365. That was a bit more challenging with the changes between SharePoint versions. Now with our hosted SharePoint site, we're experimenting with Access 2013 Web Apps that are integrated directly with SQL Azure databases for our internal and external users. Since it's hosted on SQL Azure, you can also link to the tables directly from your Access desktop databases. Try it out for free and see what you think. Here's a tricky problem we encountered. Introduced with Office 2007, the Excel XLSX file format supports spreadsheets with a million rows which is well above the 64,000 rows of the XLS format. It turns out that when exporting more than 64,000 records to Excel, you can't do it from an Access MDB file, even if you're using Access 2007, 2010, or 2013. It only works if you do so from a database in the ACCDB database format. It makes some sense in hindsight, but it took us a while to figure it out. Remote Desktop is a wonderful Windows feature that lets you connect to a computer located elsewhere and run it as if you were there. You may want to reboot that machine but the remote computer's Start menu only shows options to "Log Off" and "Disconnect". It does not offer the standard "Shut Down" options: Log off, Shut down, Restart, Stand by, Hibernate. If you press Ctrl+Alt+Del, the command is captured by the local machine and not the remote one. Read our paper Rebooting a Remote Desktop Computer to Restart It for how to do this. In case you are confused, Windows 8 was released in late 2012. It was upgraded to Windows 8.1 in October 2013. Then in April, it was replaced by "Windows 8.1 Update". Microsoft expects you to migrate to the Update version in order to receive future updates. Not sure why they didn't name it 8.2. So if you're using Windows 8, make sure you download the update for the Windows 8.1 Update. Fellow Microsoft Access MVP and FMS friend Karl Donaubauer created AccessDevelopers.org for the Access community in Germany. One of their first features is FMS President Luke Chung's paper on Microsoft Access within an Organization's Overall Database Strategy. Check out their conferences. Good luck Karl! Our newsletters are designed for you. To help us provide better service, please send us your suggestions and comments about "The Buzz", as well as our products and services. See something useful you'd like to see more of it? Want more Microsoft updates? Please Contact Us with suggestions, comments, or requests. Have you missed a past issue of our Buzz email newsletter? Thank you! Thank you! I just finished reading this document, which was part of a link in the recent Buzz newsletter. I have printed it for others to read, especially those skeptical on the powers of Access and its capabilities.